We deal in all types of fish plate, also known as joint bar, splice bar and angle bar. We have in-house rolling, forging, machining, and drilling and punching facilities to ensure accurate rail fish plate size. 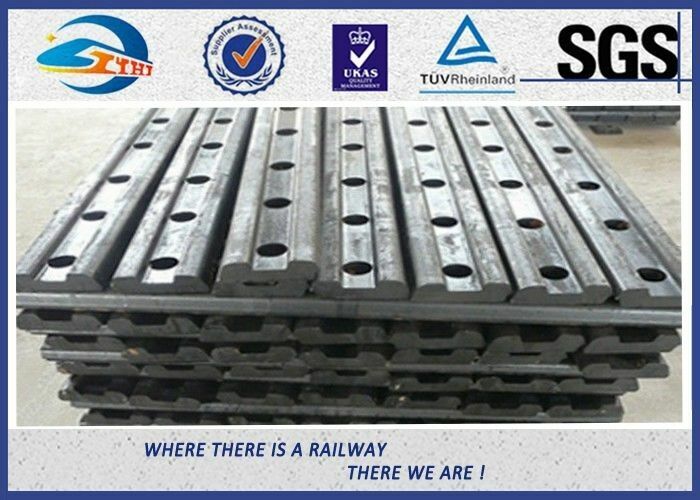 We have the capability to manufacture all types of rail fish plate to suit all types of rail sections, such as UIC 60, UIC 54, U33, BS 80A, BS 90A, IRS 52 KG, IRS 90 Lbs, 115 RE, 136 RE, TJ 45, TJ 37, RN 45, etc. Our fish plates are manufactured to international standards according to BS, ASTM and DIN, among others. We offer 4 holed or 6 holed fish plate to suit 60 kg, UIC, 54 kg UIC, 52 kg UIC, 52 kg, 90A, 90R, 80A, 80'O', 88'O', 75R, 60R, 115 RE, 132 RE, 50R rails, etc. This product is a specially forged fish plate. It is suitable for the temporary repair of cracked welded rail joints with clamp assembly to suit various rail sections. Used as an emergency clamp, joggled fish plate enables quick and temporary repair, allowing continued movements through the section at a reduced line speed. They are readily available in a considerable quantity at all times. We produce specially designed fish plates to join two different rail sections of rail tracks for various customers when they require them. Adhering to our quality first policy, ZHONGYUE pays great attention to quality control management on our rail fish plate. 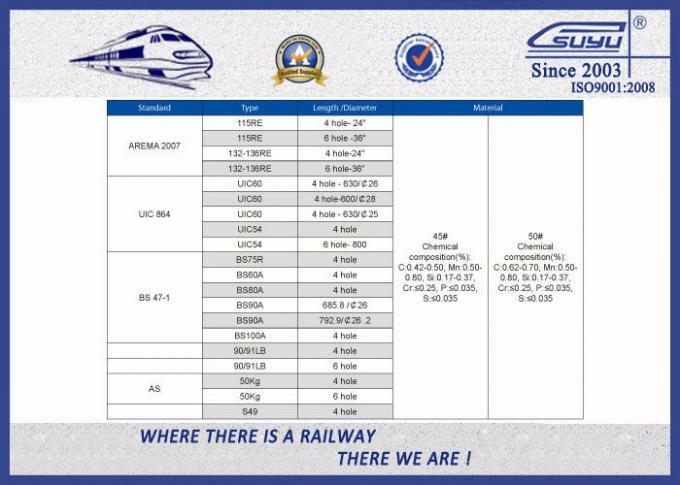 We have been granted ISO9001-2008 certificates and have received the production license of China's Railway Ministry on railway products. We have a full set of inspection instruments to ensure all our rail fish plates are of high quality and up to customers' requirements. As a leading manufacturer of rail fastening based in China, ZHONGYUE also produces many other railway fasteners, such as track bolt, sleeper screw, track spike, tie plate, rail clip, elastic rail clip, SKL tension clamp, rail shoulder, and so on.